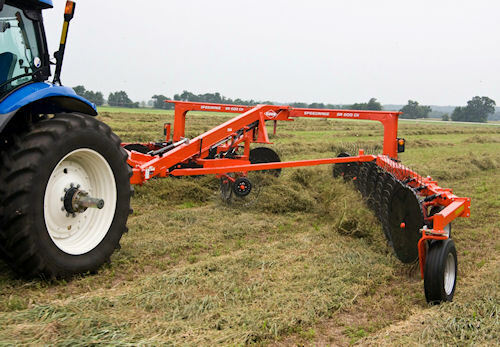 Kuhn and Krone offer new 2011 implements for hay producers. A pair of new hay making tools are available across the U.S. this spring as manufacturers Kuhn North America and Krone North America unveil some new iron. Kuhn's new SR 600 GII is the company's second generation SpeedRake featuring 14- and 16-wheel configurations and raking widths up to 31 feet. The SR 600 GII features an unfolding system that moves the rear wheels forward as the rake opens, reducing the overall length of the rake by seven feet. The shorter wheelbase also comes in handy in tight turns and when raking around corners. Kuhn's new SR 600 GII is its second generation high-capacity, heavy duty Speed Rake, capable of running widths up to 31 feet. Kuhn says its new model has an improved rake-wheel flotation for cleaner raking, less leaf loss and improved capacity. And, independent flotation settings for the two rear rake wheels on each side allow them to be set heavier to handle larger volumes of forage. The angle of the wheels also can be set to adjust the windrow width independent of the working width to best match crop conditions. Krone has a new disc mower conditioner, the EasyCut 3600 CV, in a side-pull configuration with a working width of 11' 9". The machine has the company's EasyCut cutter bar with quick-change blades and SafeCut hubs. For conditioning it uses a v-tine conditioner with an adjustable conditioner speed and an adjustable baffle plate for varying conditioning intensity. The 3600 CV comes with a two-point hitch for maneuverability in the field and on the road, and boasts a gear-driven cutter bar with roll-pin protection on each mower disc. A sheared pin allows the disc to rotate up and out of the way of neighboring discs, and protects all elements in the cutterbar driveline. The EasyCut 3600 CV is the latest disc mower from Krone. The new side-pull mower conditioner has quick change blades and works up to 11' 9". For more information on Kuhn's Speed Rake, and its other products, visit www.kuhnnorthamerica.com, or call (608) 897-2131, ext. 2259. 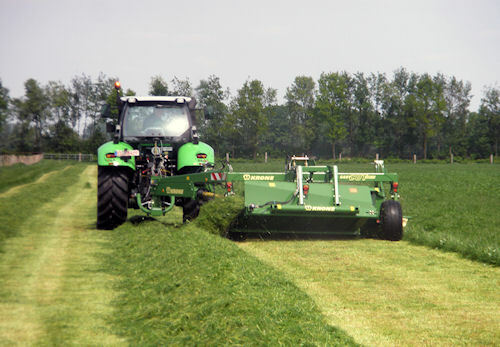 To learn more about Krone's EasyCut 3600 C, and other products visit www.krone-northamerica.com.